This Aberdeen Registered (A221) steam trawler was on her way to the Northern fishing grounds when she ran ashore on the Spur of Murkle, five miles East of Thurso. In response to a report that the vessel was ashore on Holburn Head, Thurso lifeboat, the H.C.J was launched at 5.50am to go to her aid. The lifeboat searched the coast as far West as Spear Head, but no trace of the trawler could be found. There was a westerly gale blowing, causing very heavy seas, the lifeboatmen also having to contend with an exceptionally strong flood-tide. Coxswain MacIntosh decided that the trawler must be to the east and this was confirmed when the Grimsby trawler Loch Park radioed that she was close to the 'Sunlight', which was aground on the Spur of Murkle, in Dunnet Bay. The Loch Park, (formerly the Aberdeen trawler Obsidian, A301), stood by but was unable to get close to the stricken vessel. When the lifeboat arrived, a quarter of an hour later, they found the casualty was about 200yds off-shore, having run onto one of the long edges of rock which run out to sea, forming the Spur of Murkle. The trawler was in about seven feet of water, her lee port rail awash and she was pounding heavily in the very rough seas. Coxswain MacIntosh at first thought that he could probably get the crew off the trawler by using the breeches-buoy, but then he realised that the trawler was perched on the edge of the ledge and could slip off at any moment. He therefore decided to go alongside straight away. With superb seamanship, he put the bows of the lifeboat against the lee quarters of the trawler, a line was quickly taken aboard and with the help of this, the lifeboat got alongside head-to-sea. Quickly the crew of the trawler scrambled aboard the lifeboat, all eleven men being rescued in just five minutes. The line was cut and Coxswain MacIntosh headed out into deeper water and back to Scrabster. Later the Sunlight slipped from the ledge becoming a total loss. For his outstanding seamanship and great courage during this difficult and dangerous rescue, Coxswain Angus MacIntosh was awarded the Thanks on Vellum by the RNLI. In 1977 the wreck was just visible below the surface at low tide and the boiler lay on the rocks for many years before finally being pulled under. Possible position 58 36 53N, 03 25 45W. A copy of the Board of Trade Wreck Report can be found by clicking here. She was built in 1918 by Scotts of Bowling as the Admiralty Strath-Class Trawler Thomas Graham. She was loaned to the U.S. Navy 1919, presumably for clearance of the Northern Mine Barrage Sold in 1921, she passed to Grimsby owners, then in 1927 to North Shields owners who re-named her Tynemouth Abbey. She came to Aberdeen in December 1932 under the ownership of the Harrow-Baxter Steam Fishing Co. Ltd. who renamed her Sunlight in July 1933. 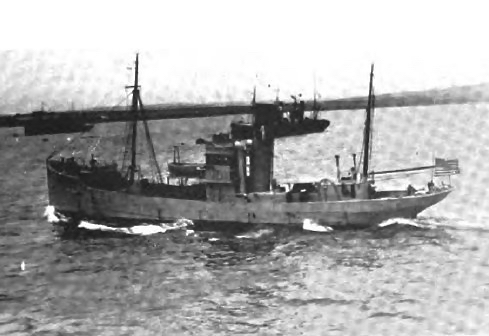 Her second spell of War Service began in July 1940 with her conversion to become a boom defence vessel in which capacity she was engaged until July 1944. She was wooden built, 35m Long by 7m wide and 203 gross registered tons. She had one triple expansion engine, a single shaft and one screw. The Sunlight when she was working for the US Navy as the Thomas Graham.